Alexander fathered JAMES AGNEW (of course, one of many). This James was born in Ireland. Emigrated to Pennsylvania from Ireland. Arrived in Gettysburg, Adams County, Pennsylvania after 1739. James Agnew II in America brought a large plantation of more than 500 acreas at March Creek, then a district in Lancaster County, later called York County, Now Adams County. It was on a Run called Lick Run which flows into Marsh Creek. 1756 Captain of York County Associators for defense against the Indians. 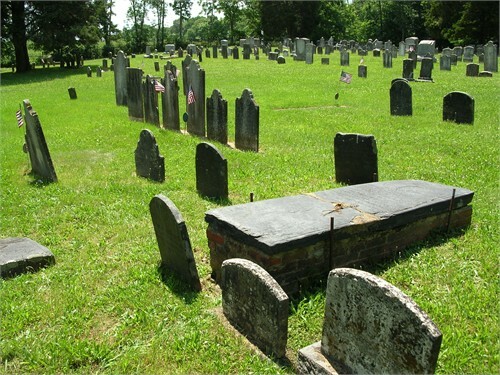 10/2/1770 Died at Hamilton Ban, York, Pennsylvania. Buried “under a large, flat stone, upon which were cut the “Arms” of the Agnews of Locknaw, Hereditary Sheriffs of Galloway. 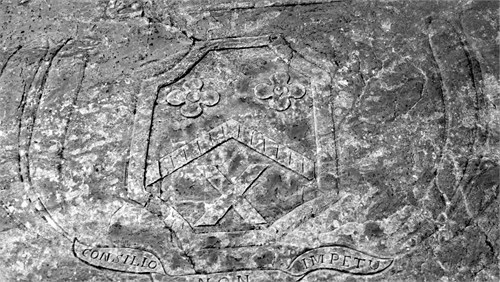 HERE IS MORE, I AM BLOWN AWAY: This is a close-up of the coat of arms of the Agnews of Lochnaw, Scotland, from whom James descended. The history of the family is recorded in “The Book of the Agnews: James Agnew of Pennsylvania” by Mary V. Agnew and is also found in one or more of the Burke’s peerage books of Great Britain. Before James’s family lived in Ireland, they were hereditary sheriffs of Galloway, Scotland, and James’s 8th-great-grandparents were Andrew Agnew of Lochnaw and Mary Kennedy, Mary being a granddaughter of King Robert III of Scotland, who in turn was the son of Robert II, who was a grandson of Robert I, famously known as Robert the Bruce. NOW, if this is our James, this James (above) lived with wife MARY in OHIO and in 1850 they had a son also named JAMES who is MY great-grandfather JAMES, b.1841 in Ohio, who ends up in New Albany, Indiana. There are other stories to explore and mysteries to solve. James C. may or may not be our James, father of my great-grandfather James. His wife, Mary, in 1850 is not old enough to be our James’ mother. So who was his mother? The elder James in 1850 says he was born in PA., and there is an elder Samuel living with them. Now, there is a ton of information to check & look into in this entire LINE, which is what I’ll be working on when I have time. This is very exciting & I hope it all checks out. There are some records that are confused, so it will take time. This entry was posted on September 1, 2011 at 11:07 pm and is filed under family tree research. You can follow any responses to this entry through the RSS 2.0 feed. You can leave a response, or trackback from your own site. My name is Samuel Ferrell Agnew, and I too decend from James Agnew (1711-1770). From Gettysburg my line moved to South Carolina, where Samuel Agnew was in the SC militia in the Revolutionary War.Moved to Mississippi in 1852. Email address is samagnew@bellsouth.net. There is also a dna testing going on through familytreedna.com, if you are interested. Hello, my family history matches yours almost exactly. However I have Samuel with son James living in SC. With James’ son being Elijah, married to Susannah (Susan) Nix also SC. Would love to compare records. My grandmother was an Agnew of this line. She kept the tartan.